Non-cancerous growths or lumps of muscle tissue that form within the walls of the uterus. Fibroids are usually benign (non-cancerous) smooth muscle tumors which occur in the womb (uterus). They are also referred to as leiomyoma, leiomyomata, or myoma. Fibroids usually occur in groups; it is uncommon to have just one fibroid tumor. They can grow inside the uterus, within its walls, or on its outer surface. Fibroids are the major cause of hysterectomies (removal of the womb). Fibroids occur in about 50 per cent of women. 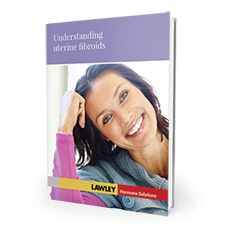 Many women will go through life not even knowing that they have fibroids as they do not commonly cause symptoms. Progesterone deficiency or estrogen dominance during reproductive the years results in fibroid development and growth. Fibroids diminish in size with declining estrogen levels at menopause. Untreated fibroids will continue to grow under the influence of estrogen dominance. May affect the menstrual cycle or period, fertility, or be the cause of miscarriage or premature labor. Many fibroids are slow-growing, so symptoms may not develop until a woman is over 35, especially when the fibroids have enlarged to the same size as a three-month pregnancy – enough to interfere with menstruation and fertility. Only 1 woman in 1,000 who has fibroids develops leiomyosarcoma, which is cancer of the muscle layer of the uterus. Affected women average 58 years old. It is extremely rare for younger women to develop cancer in conjunction with fibroids. Clues that you may have leiomyosarcoma are very quickly growing fibroids and postmenopausal bleeding. If you were diagnosed with fibroids before menopause and experience vaginal bleeding after your periods have stopped for at least 12 consecutive months, then see your doctor as soon as possible. Fibroids may be genetic; if women in your family have fibroids, you are more likely to have them, too. Fibroid growth is associated with too much estradiol, the most active form of estrogen hormone produced by the ovaries, and too little progesterone. Fibroid growth is associated with too much estradiol, the most active form of estrogen hormone produced by the ovaries, and too little progesterone. This hormonal imbalance is most common during perimenopause, which takes place from age 35 to 50 in most women. Tests: Ultrasound or laparoscopic examination. Usually found during a gynaecological exam, ultrasound, hysteroscopy, laparoscopy, or during surgical procedures for other conditions. Secondary Consideration: Fertility probably affects less than three per cent of women. In very rare instances, a fibroid may become cancerous and is called a sarcoma. If your fibroids cause no symptoms (are asymptomatic), then your doctor will probably adopt a course of watchful waiting. That means measuring the fibroids once every six months to their detect growth, and asking you if your periods have changed. Your doctor will probably advise you to leave your fibroids alone until they exceed 2.5 cm in size (less than one inch), or if they start to produce symptoms that degrade your quality of life. If your fibroids are large, they pressurize your other internal organs, so you should give serious consideration to their removal if they are symptomatic. Your doctor may prescribe a daily iron tablet to prevent anemia from heavy bleeding. If you do not wish to conceive, your doctor may suggest you take combined birth control pills indefinitely to stop the rapid fluctuations of your hormones and estrogen dominance that encourage your fibroids to grow. Many women successfully control their fibroid symptoms with natural progesterone cream. This can relieve heavy bleeding associated with uterine fibroids and reduce the size of small and medium sized fibroids. If you are perimenopausal, anemic, and do not want surgery, you may opt for a gonadotropin-releasing hormone agonist (GnRH agonist). What is the second-line treatment? What is the third-line treatment?